Today I want to ask about philosophical ideologies or movements that can help me understand what is happening behind a character that I want to analyze. First a bit of character context. Aysel (real name) is a Mexican werewolf; She was born as a lycan and has lived her life knowing that it is neither human nor animal, from the age of 13 has been able to transform into a wolf and a wolf-woman, without having to depend on the full moon. All a classic Lycan character ... until 2 weeks ago when I asked his family a question in a session "Ask the characters what you want (͡ ° ͜ʖ ͡ °)". How do you feel knowing that there is a monster inside you? I know that they try to be good parents and good students etc. But you are a danger for everyone, one day you will lower your guard and the wolf will try to take over everything you are, your mind will scream for violence and blood, What does it feel to know that they are something that will never belong totally to something human or Something animal? PS What would you do if suddenly there was a cure for lycantropia ?, Would you use it or be a lycan and live with your family so important that you can never leave one? She talks about that werewolves are not a danger, they only defend themselves as wolves when they are threatened, and that although they have already made her feel like a monster, even the lycan have dreams and goals and beings that love them . She would never leave her family. She is proud of what she is. And I could see a bit of Humanism VS Post-Humanism and something of Transhumanism. Also the eternal struggle between what it means to be human and what a being that is not human or animal represents; Also in my last analysis I also mention Sloterdijk of the post-humanist movement. *An image where she is seen that her parents tell her that she is not like other humans and that they should hide it and she must accept what is, but despite this, her mind breaks and she cries disconsolate. When her parents beg her to accept what she is, she screams that she can not. **Is there any school of philosophy for this? Buen día, que tal? El día de hoy quiero preguntar acerca de ideologías o movimientos philosoficos que puedan ayudarme a entender lo que ocurre detrás de un personaje que quiero analizar. Primero un poco de Contexto del personaje. 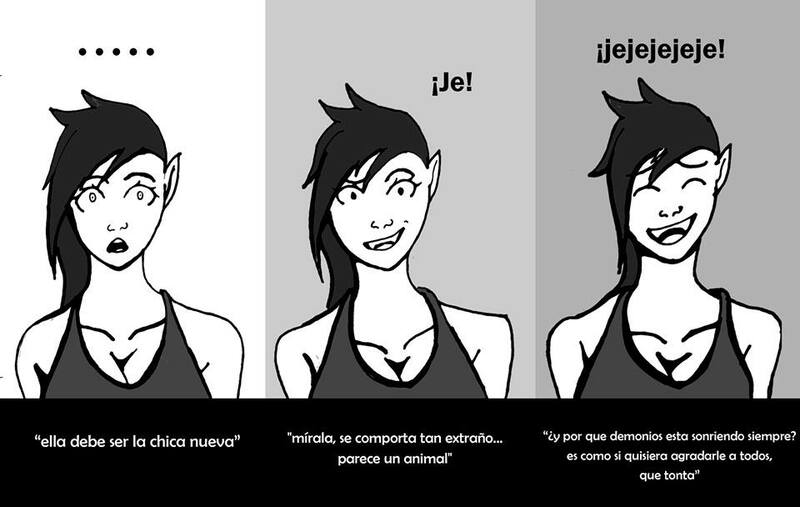 Aysel (nombre real) es una mujer lobo mexicana; Ella nació como una lycan y ha vivido su vida sabiendo que no es algo ni humano ni animal, desde los 13 años ha podido transformarse en una loba y una mujer-loba, sin tener que depender de la luna llena. Como es normal esto le repercutió mucho en su psyche y en su vida como adolescente. ¿Cómo se sienten al saber que existe un monstruo dentro de ustedes? Sé que intentan ser buenos padres y buenos alumnos etc. Pero son un peligro andante para todos, un día bajaran la guardia y el lobo tratara de apoderarse de todo lo que son, su mente gritara por violencia y sangre, ¿Qué se siente saber que son algo que no pertenecerá jamás a totalmente a algo humano o a algo animal?, ¿Qué se siente ser un peligro caminante? PD ¿Qué harían si de repente existiera una cura para la lycantropia?, ¿La usarían o es ser un lycan y vivir con su familia tan importante que no pueden dejar a ninguno jamás? Una imagen donde ella habla de que los hombres-lobo no son un peligro, solo se defienden como los lobos cuando estos están amenazados, y que apesar de que ya la han echo sentir como un monstruo, incluso los lycan tiene sueños y metas y seres que los aman. Y pude ver un poco de Humanismo VS Post-Humanismo y algo de Transhumanismo. También la eterna lucha entre lo que significa ser humano y lo que un ser que no es humano o animal representa; También en mi análisis pasado mencione también a Sloterdijk del movimiento post-humanista. Una imagen donde se le ve que sus padres le dicen que no es como los demás humanos y que deben ocultarlo y ella debe aceptar lo que es, pero a pesar de esto su mente se rompe y ella llora desconsolada al momento de que le piden que acepte lo que es…ella solo responde que no puede. **¿Existe alguna escuela de filosofía para esto? Thanks a lot to: – ClearMountainWay for guiding me in this endevor. There is a lot of recent study about the nature of animality sparked by the book "The Animal That Therefore I Am" by Jacques Derrida. But also the sociology of Cary Wolfe on animality and post-humanism. I would check out also the journal Humanimalia (depauw.edu/humanimalia) to see if they've published anything on werewolves. The only thing that I'm familiar with on this theme is Deleuze's rewriting of the image of werewolves as representations of "becomings-animals" that have nothing to do with physical werewolves but mystifications of human-animal inclusive disjunctions. Not the answer you're looking for? Browse other questions tagged philosophy-of-mind existentialism dualism humanism or ask your own question.